Each patent application is a customized document that is designed to pitch the invention to investors, examiners, judges, and a jury. A few structural aspects and mechanical drafting techniques of a patent application are discussed in this section. The Detailed Description and Drawing sections are the minimum requirements to file and secure a filing date as a provisional application. 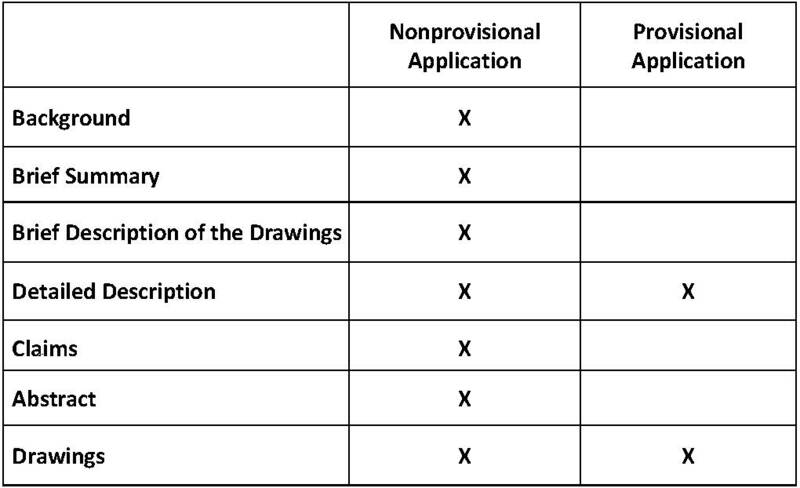 One or more of the remaining sections can be included when filing an application as a provisional patent application. The Detailed Description, Drawings, and at least one claim in the Claims section are the minimum requirements to secure a filing date or patent pendency when filing a nonprovisional application. However, all seven sections are required to move forward into the examination stage with a nonprovisional patent application and to eventually secure a patent. If a patent application does not have all the required sections or does not follow the recommended arrangement, it will not satisfy the formal requirements of the USPTO. In that case, the USPTO will issue a notice of missing parts and the applicant will have time to provide the missing sections and rearrange the patent application. Please be aware that initially cutting corners may ultimately be costlier compared to properly preparing the patent application in the first place. It is best to invest the time and money to prepare the application correctly the first time. Paragraph 1: The various embodiments and aspects described herein relate to a writing instrument. Paragraph 2: Various issues relating to writing instruments are known in the art. Accordingly, there is a need in the art for an improved writing instrument. As the example above illustrates, the first paragraph of the Background section should be one sentence that sets the stage (i.e., field of the invention) for the present invention. A typical first paragraph of the Background section may use the phrasing: “The embodiments and aspects described herein relate to a [insert generic term for inventive product or process].” The second paragraph should briefly describe the state of the current prior art related to the invention and perhaps the problems or issues associated with the current technology such as cost or ease of use. The case Leo Pharmaceutical Products LTD v. PTO24 illustrates why the Background section should not provide an exhaustive explanation of the prior art. The Leo case involved a drug (vitamin D and corticosteroids) that an inventor had newly redesigned to be storage stable. Galderma (accused infringer) attempted to attack the validity of Leo Pharmaceutical Product’s patent via an inter partes reexamination proceeding held at the USPTO.25 Galderma contended that the claimed invention was an obvious combination of prior art references. The prior art disclosed compositions containing both vitamin D and corticosteroids. To obtain a storage stable composition, the inventor added a particular solvent to increase the stability of vitamin D and corticosteroids. To defend against the invalidity attack, Leo (patent owner) contended that the prior art references did not recognize the need to combine the teachings of the two references to combine vitamin D and corticosteroids.26 If the Background section had indicated the problem with the prior art, it could have been argued that it provides the necessary motivation to combine references to come up with the claimed invention and thus be an obvious variant of the prior art. However, if a patent owner does not highlight the problem in the Background section, the obviousness argument, or the invalidity argument to combine references that the accused infringer put forth, would not be available to invalidate the patent. In the case example above, Leo did not include problems with the prior art in the Background section. In the opinion, this absence was highlighted as a reason for non-obviousness. Thus, the patent owner successfully argued against this argument and won the inter partes reexamination. The Background section is supposed to describe the current state of the art but is sometimes written in a way that also recognizes problems and potential solutions brought up by others in the field that might be used against the patent application or patent to show the invention as being obvious. If the specific problem had been recognized in the Background section in the above example, the solution (i.e., Leo’s invention) may have been interpreted as an obvious variant of what was already known in the art. Identification of the problem in the Background section is sometimes used to show that the invention was not novel or obvious and thus not patentable. This case illustrates the advantage of omitting any information about the problem that led to the invention. Side Note: If an inventor wants to submit a description of the current state of the prior art for the benefit of the examiner’s knowledge, there are less risky options. For example, as discussed in Chapter 7, the inventor could submit an Information Disclosure Statement (IDS), which includes various, third-party, printed publications that disclose prior art information, or an article identifying the problems and issues related to the present invention. This information can also be presented to the examiner in the remarks section of a response to an Office Action or telephonic interview with the examiner. Presented this way, the negative impact of disclosing the information may be mitigated because it would be considered attorney arguments and information submitted without a declaration by the inventor. By contrast, if prior art problems are included in the patent application’s Background section, it is submitted with a declaration wherein the inventor states, under penalty of perjury, the following statement: “I hereby state that I’ve reviewed and understood the contents of the above identified application, including the claims, as amended by any amendment specifically referred to above.” Statements and comments made in the patent application may therefore be given more weight than statements made by an attorney. To mitigate detrimental effects, an applicant can include a just short, generic description of the prior art in the Background section and then supplement information about the prior art in an IDS, the remarks section of an Office Action, or a telephonic interview with the examiner. The Brief Summary section summarizes the Detailed Description section and is typically written after the Detailed Description section has been drafted. This way, the drafter has the advantage of thinking through the invention while writing the Detailed Description section and can better summarize the invention in the Brief Summary section later. The first paragraph should summarize the invention’s point of novelty and benefit. The examiner is given a fixed amount of time to read and learn about the intricacies of the invention. The examiner can quickly identify the point of novelty of the invention if the applicant includes the point of novelty and that which the inventor wants to protect in the first paragraph. The subsequent paragraphs should further illustrate the various embodiments, features, and benefits of the present invention. However, in my opinion, it is better to use these paragraphs to restate the language found in the Claims section. This will help satisfy the patent rule that each term in the patent Claims section finds antecedent basis29 within the patent specification, as discussed previously. Each term or phrase used in the Claims section should therefore be repeated in the Brief Summary section. The claims can be cut and pasted in the Brief Summary section after the first paragraph and then modified into sentence format. Figure 4 is a cross sectional view of the mechanical clicker shown in Figure 2 after being depressed and the lead is advanced. I spend eighty to ninety percent of my time on the Detailed Description when I prepare a nonprovisional patent application for a client. It should underscore the point of novelty, typically in the first paragraph. The examiner should be able to quickly identify the point of novelty in both the first paragraph of the Brief Summary and the Detailed Description section. Note, however, that the language describing the point of novelty in the first paragraph of the Detailed Description section should be different than that used in the first paragraph of the Brief Summary section. Subsequent paragraphs of the Detailed Description section should describe the various, alternative embodiments and features of the invention as well as contain reference numerals that refer to the figures in the Drawings section. One should be able to read the Detailed Description section and refer to the drawings for clarification. For an explanation of the numbering system, please see the section on the Drawings section below. The description of the invention in the Brief Summary and Detailed Description section act as a dictionary for the terms and phrases used in the Claims section. It is therefore important to describe the invention clearly and concisely without unduly limiting the scope of the claim language and the scope of patent protection afforded by the claims of the patent. The Abstract section is a short summary (no more than 150 words) about the point of novelty and may be shorter than the first paragraphs of the Brief Summary and the Detailed Description section. The Abstract is typically drafted after writing the first paragraphs of the Detailed Description and Brief Summary so that the drafter has the benefit of thinking through the invention’s point of novelty before drafting the Abstract section. If the Abstract section contains more than 150 words, it is not fatal to the patent application, but the examiner will object to it and require the applicant to amend the abstract to comply with the 150- word limit. Drawings may be hand-sketched in a provisional patent application but must be depicted in clear black solid lines in a nonprovisional application. They are typically computer drawn. The various figures in the drawing section should tell a story such that a reader can have a basic understanding of what the point of novelty might be. I highly recommend utilizing a professional patent draftsperson38 after first creating an initial, basic flow of the drawings. In the mechanical pencil example, the first figure could present the mechanical pencil in hand with the index finger on the mechanical clicker system. The second and third figures could present cross sectional views of the mechanical clicker system showing the button in a non-depressed and depressed state to illustrate how the lead rod advances through the mechanical clicker system. The last figure could show the removal of an eraser to demonstrate access of the lead rod to a depository within the tubular body. The figures show a story of how the mechanical pencil is used and thereby illustrate the point of novelty. Side Note: In the text, reference numbers are linked to corresponding reference numbers in the drawings. Reference numerals normally start with “10” and are sequentially incremented by two. If, upon review of the patent application, more numbers are necessary, odd numbers may be used to maintain sequential order in the text. No single reference number may be used to refer to different parts. 24. Leo Pharmaceutical Products LTD PTO (Fed. Cir. August 12, 2013). 25. A third-party requests an inter partes reexamination at the USPTO to have a patent reexamined based on new prior art references (i.e., patents and printed publications of patent applications) to invalidate a patent or have the claims narrowed to avoid patent infringement liability. 26. During examination, the claimed invention was rejected and the inventors appealed the case to the Board of Patent Appeals and Interferences. During the appeal, the inventor showed that the prior art either discouraged combining vitamin D and corticosteroids in a single formulation or had attempted the combination without recognizing or solving the storage stability problems associated with combining the two. They showed that the prior art taught away from solving the store stability problems and they won the appeal. Here is a relevant quote from the case: “The inventors of the ‘013 patent recognized and solved a problem with the storage stability of certain formulations – a problem that the prior art did not recognize and a problem that was not solved for over a decade. As an initial matter, an invention can often be the recognition of the problem itself” (emphasis mine). 27. Ultimate Pointer LLC v. Nintendo Co. Ltd. (Fed. Cir. March 1, 2016). 28. The inventor drafted the patent to use the invention for conducting However, the inventor shifted the focus of the invention’s use to games. This created significant problems in trying to broaden the patent beyond its originally designed purpose. Nevertheless, this case demonstrates that if the patent application disparages prior art, it may narrow the patent claims. Furthermore, if prior art problems need to be explained to secure a patent claim allowance, it may be preferable to explain the problems through the IDS or a telephonic interview where less written documentation (i.e., less evidence) is required as discussed in this chapter.